Not to be confused with Steve Harley. Harvey was born on January 17, 1957, in Welch, West Virginia, and is the son of Jesse Harvey, a coal miner, and Eloise Vera. His first name is Broderick, named after actor Broderick Crawford of the TV series Highway Patrol. Harvey's family moved to Cleveland, Ohio, living on East 112th Street, which was renamed Steve Harvey Way back in 2015. He graduated from Glenville High School in 1974. Shortly after high school, he attended Kent State University and West Virginia University and is a member of Omega Psi Phi fraternity. He has been a boxer, an autoworker, an insurance salesman, a carpet cleaner, and a mailman. Harvey first performed stand-up comedy on October 8, 1985, at the Hilarities Comedy Club in Cleveland, Ohio. In the late '80s, Harvey was homeless for multiple years. He slept in his 1976 Ford when not performing gigs that provided a hotel, and he showered at gas stations or swimming pool showers. Rich and Becky Liss helped Harvey during this time with a contract for carpet cleaning and credit at a travel agency. He was a finalist in the Second Annual Johnnie Walker National Comedy Search performing on April 16, 1990, eventually leading to a long stint as host of It's Showtime at the Apollo, succeeding Mark Curry in that role. His success as a stand-up comedian led to a starring role on the short-lived ABC show Me and the Boys in 1994. He would later star on the WB network show, The Steve Harvey Show, which ran from 1996 to 2002. While popular, the show never achieved critical acclaim outside of the African-American community. In 1997, Harvey continued his work in stand-up comedy, performing on the Kings of Comedy tour along with Cedric the Entertainer, D.L. Hughley, and Bernie Mac. The comedy act would later be put together into a film by Spike Lee called The Original Kings of Comedy. DVD sales of The Original Kings of Comedy and Don't Trip, He Ain't Through with Me Yet increased Harvey's popularity. He released a hip hop and R&B CD on a record label he founded, and authored the book Steve Harvey's Big Time. 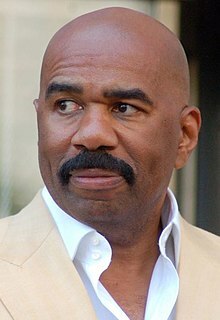 That title was also used as the name of his comedy and variety television show (later renamed Steve Harvey's Big Time Challenge), which aired on The WB network from 2003 until 2005. Harvey launched a clothing line that featured dresswear. In 2005, he co-starred in the movie Racing Stripes. He had appeared in the 2003 movie The Fighting Temptations alongside Cuba Gooding Jr. and Beyoncé Knowles. He achieved further critical and commercial success through his book Act Like a Lady, Think Like a Man and its subsequent cinematic follow-up, Think Like a Man, an ensemble romantic comedy depicting characters taking advice on dating from the book. In 2008, Harvey hosted the Disney Dreamers Academy, a teen-focused personal and professional enrichment event that took place January 17–20, 2008, at the Walt Disney World Resort in Lake Buena Vista, Florida. On August 2, 2012, Harvey performed his final stand-up act at the MGM Grand in Las Vegas, ending a 27-year career as a stand-up comedian. The two-hour performance was broadcast live on Pay-Per-View. “The road to this final show has been an amazing journey, doing stand-up for the past 27 years, and I can’t thank fans enough after reflecting on all those years on stage,” he said. 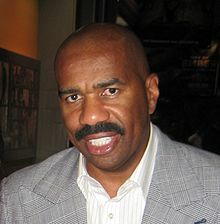 Harvey began hosting Family Feud in August 2010. The show has seen significantly improved ratings under Harvey. As of November 2012, it was the second most watched daytime syndicated show. Harvey also hosts Celebrity Family Feud, where celebrities compete for a chance to donate up to $25,000 to their favorite charity. The show airs during the summer on ABC. In September 2012, Harvey debuted a self-titled syndicated talk show produced by Endemol and distributed by NBCUniversal Television Distribution at the NBC Tower in Chicago. The show was renewed through 2016. 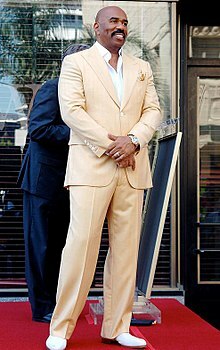 In November 2016, Steve Harvey was cancelled, and it was announced that Harvey had reached a deal with IMG to produce a new syndicated talk show in Los Angeles with NBCUniversal. The new series, Steve, premiered in September 2017, and was described as having more of a celebrity- and comedy-oriented format with a larger amount of creative control held by Harvey, as opposed to the previous program's larger focus on human interest subjects. To facilitate the new series, production of Harvey's radio show and Family Feud were relocated to L.A. as well. In December 2015, Harvey hosted the Miss Universe 2015 pageant in Las Vegas. Upon announcing the final results, he mistakenly named the first runner-up, Miss Colombia, Ariadna Gutiérrez, as the winner. A few minutes after she was crowned, Harvey announced that he had read the results incorrectly and that Miss Philippines, Pia Wurtzbach, was the new Miss Universe. He apologized to Wurtzbach outside the venue and later tweeted an apology to both contestants. Harvey also hosted the Miss Universe 2016 pageant in the Philippines on January 30, 2017, telling the Miss Universe Organization that he wanted to personally apologize to the Filipinos for the incident that occurred in the last Miss Universe pageant he hosted. Harvey returned to host the Miss Universe 2018 pageant in Thailand on December 16, 2018. In October 2016, it was announced that Harvey would host two revival specials of Showtime at the Apollo for Fox. In 2017, Harvey began hosting a New Year's Eve special from Times Square for Fox (which, like his talk show, would be produced in partnership with IMG). Two days before the broadcast, Harvey was ordained in the state of New York so he could officiate an on-air wedding between Keven Undergaro and Maria Menounos during the special. The special was Fox's most-watched New Year's Eve broadcast to date. In August 2011, on his radio show, Harvey called Cornel West and Tavis Smiley, "Uncle Toms", because of their criticism of President Barack Obama. Harvey later apologized for using the slur but maintained his criticism of West and Smiley. In January 2017, Harvey was met with backlash from some in the African-American community for his decision to meet with then–President elect Donald Trump. He defended his decision, citing that it would help spark positive changes, but then later admitted on his talk show that he hopes to never run into Trump again. Harvey has received criticism for a May 30, 2009, book interview he gave on Larry King Live, which was guest hosted by Joy Behar. During that interview, he asserted that women should not date atheists who, he claimed, have no "moral barometer." He opined that atheists are "idiot[s]" and stated that his usual response to discussions with atheists is to walk away. In January 2017, Steve Harvey made jokes on Steve Harvey about Asian men, ridiculing the idea that any white woman or black woman would want to date them. "Excuse me, do you like Asian men?" he said, "No, thank you." He went on to add, "I don't even like Chinese food." The remarks were met with criticism from members of the Asian American community, including New York politicians and author Eddie Huang. Harvey apologized on his talk show and Twitter, saying: "I offer my humblest apology for offending anyone, particularly those in the Asian community. … It was not my intention, and the humor was not meant with any malice or disrespect whatsoever." In response to a caller from Flint, Michigan, who insulted the Cleveland Cavaliers after their loss to the Golden State Warriors, Harvey, a Cavaliers fan, told the caller to "go have yourself a nice glass of brown water!" in reference to the city's water crisis. The joke was criticized by, among others, Amariyanna Copeny and Flint Mayor Karen Weaver, who demanded a public apology. Harvey responded by saying, "The caller and I were talking trash about our teams and cities. Simply trash talking about sports. I made a joke directed at him, as he is from Flint, a city for which I have great affection and respect. So much so that I devoted a full hour on my daytime talk show to raising awareness for the Flint water crisis. … The caller laughed, as my joke was taken in the context it was offered." Harvey has been married three times and has seven children (four biological and three stepchildren). From his first marriage, to Marcia Harvey, he has two daughters (twins Brandi and Karli) and one son (Broderick Harvey Jr.). From his second marriage, to Mary Shackelford, Harvey has another son named Wynton. The couple divorced in November 2005. In 2011, Collin County, Texas–based 199th District Court Judge Robert Dry expressed concern about Mary Harvey spreading false information about the divorce, with the judge suggesting that she had not been left materially destitute. In June 2007, he married Marjorie Bridges, who he says is responsible for making him a better man and changing his life. Marjorie Harvey is mother to three children (Morgan, Jason, and Lori ). Steve raises them as his own. Steve and Marjorie have five grandchildren: three through Jason's marriage to his wife Amanda, one through Morgan's marriage to her husband Kareem, and one through Karli's marriage to husband Ben. 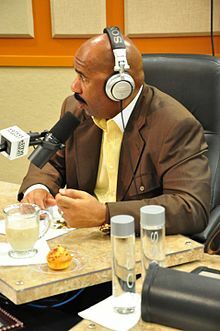 Harvey and his family divide their time between Atlanta, where his radio show is broadcast and Family Feud is recorded, and Chicago, where he hosts his talk show for NBCUniversal from the company's Chicago studios, although he will host his radio show there as well. Harvey reports that he has gone vegan for health reasons and has presented the rationale for his diet on his TV program. 2001 The Proud Family The Credit Card (voice) Episode: "Don't Leave Home Without It"
2002 My Wife and Kids Steve Episode: "Jay the Artist"
2003 The Parkers Mr. Barnes Episode: "The Hold Up"
^ Rozen, Leah (October 3, 2014). "Steve Harvey on Success and His Hard-Won Life Lessons: "I'm Living Proof You Can Reinvent Yourself"". Parade. Athlon Media Group. Retrieved October 23, 2015. ^ a b Family Feud. February 4, 2013. 6 minutes in. GSN. Also aired August 16, 2015. ^ Family Feud. February 10, 2014. 3 minutes in. GSN. Aired March 12, 2017 on GSN. ^ "Steve Harvey". TVGuide.com. Retrieved December 21, 2015. ^ "Steve Harvey Breaks Down Crying During Birthday Surprise: This Is the Greatest Moment I've Ever Had – E! Online". E! Online. January 16, 2015. ^ "Steve Harvey Biography". Retrieved March 25, 2009. ^ Rozen, Leah. "Steve Harvey on Success and His Hard-Won Life Lessons: 'I'm Living Proof You Can Reinvent Yourself'". ^ a b c Allard, Sam (January 16, 2015). "Cleveland Just Renamed E. 112th St. "Steve Harvey Way" | Scene and Heard: Scene's News Blog | Cleveland Scene". Clevescene.com. Retrieved June 10, 2015. ^ a b c d "Yahoo". Archived from the original on December 17, 2007. ^ Dawidziak, Mark (August 17, 2009). "Steve Harvey joins GMA". The Plain Dealer. Retrieved August 18, 2009. ^ Yadegaran, Jessica (July 20, 2010). "15 Minutes with Steve Harvey". Contra Costa Times. ^ "Steve Harvey has emotional reunion". January 9, 2013. ^ Triggs, Charlotte (October 3, 2013). "Steve Harvey: I Was Homeless for Three Years". People. Retrieved September 21, 2014. ^ Boedeker, Hal (January 23, 2013). "Steve Harvey sheds tears over generous Orlando supporters". Orlando Sentinel. Archived from the original on September 27, 2014. Retrieved September 27, 2014. ^ "Steve Harvey- Biography". Yahoo! Movies. Archived from the original on March 3, 2013. Retrieved June 24, 2013. ^ Brown, Scott (September 18, 2003). "The Fighting Temptations". Entertainment Weekly. Retrieved June 24, 2013. ^ Saltz, Rachel (April 19, 2012). "'Think Like a Man' Brings Steve Harvey's Book to Life". New York Times. Retrieved June 24, 2013. ^ "with Steve Harvey". Disneydreamersacademy.com. Retrieved June 10, 2015. ^ "Steve Harvey Grand Stand-Up Finale: Comedian Calls It Quits With Last Show In Las Vegas". Huffingtonpost.com. August 1, 2012. Retrieved June 10, 2015. ^ "Watch: Steve Harvey's Tearful Goodbye To Stand-Up At His | Shadow and Act". Blogs.indiewire.com. Retrieved June 10, 2015. ^ Albiniak, Paige (January 21, 2010). "Steve Harvey to host Family Feud". Broadcasting & Cable. Retrieved January 22, 2010. ^ "Looking to Reach Women in Daytime TV? Syndication Is a Solid Alternative". Broadcastingcable.com. Retrieved February 28, 2013. ^ Dove, Steve (June 5, 2015). "Celebrity Contestants Announced for "Celebrity Family Feud"". ABC press release. Retrieved June 13, 2015. ^ "'Celebrity Family Feud' to Premiere Sunday June 21, on ABC With Episode Featuring Anthony Anderson & Toni Braxton". tvbythenumbers.zap2it.com. Retrieved June 11, 2015. ^ "Vernon Davis Is Terrible at Family Feud, Which It Turns Out, Is Also Awful". awfulannoucing.com. Retrieved June 29, 2015. ^ "New 'Steve Harvey' TV show coming to Chicago studio". Chicago Sun-Times. Sun-Times Media Group (Wrapports LLC). March 12, 2012. Retrieved September 18, 2015. ^ Andreeva, Nellie (January 10, 2013). "NBCUniversal Domestic TV Distribution's 'Steve Harvey' Renewed For Second Season". Deadline Hollywood. Retrieved September 18, 2015. ^ Goldberg, Lesley (January 10, 2013). "'Steve Harvey' Syndicated Talk Show Renewed for Second Season". The Hollywood Reporter. Prometheus Global Media. Retrieved September 18, 2015. ^ ""Steve Harvey" Renewed for Second Season in National Syndication". The Futon Critic. Futon Media. Retrieved September 18, 2015. ^ Bibel, Sara (June 12, 2013). "'Steve Harvey' Sold Through 2016 to NBC Owned Television Stations". TV by the Numbers. Tribune Digital Ventures. Retrieved September 18, 2015. ^ Andreeva, Nellie. "Steve Harvey To End Daytime Talk Show, Launch New One With IMG & NBCU". Deadline. Retrieved 11 November 2016. ^ Roberts, Kimberly C. "Steve Harvey returns to daytime with new look, new vibe". Philadelphia Tribune. Philadelphia: Tronc. ISSN 0746-956X. Retrieved September 6, 2017. ^ Stelter, Brian (December 21, 2015). "Steve Harvey mistakenly crowns the wrong Miss Universe 2015". CNNMoney. Retrieved December 21, 2015. ^ Hegina, Aries Joseph (December 21, 2015). "Steve Harvey apologizes for Miss Universe mix-up; misspells PH, Colombia". Philippine Daily Inquirer. Retrieved December 21, 2015. ^ "WATCH: Host says sorry to Pia Wurtzbach over mix-up". ABS-CBNnews.com. ABS-CBN Corporation. December 21, 2015. Retrieved December 21, 2015. ^ "Host Steve Harvey Botches Miss Universe Announcement". NBC News. Dec 21, 2015. Retrieved December 21, 2015. ^ "Steve Harvey will host Miss Universe in PH". ABS-CBN News. July 29, 2016. Retrieved July 30, 2016. ^ Petski, Denise (2018-07-31). "Miss Universe 2018 Heads To Thailand With Steve Harvey Returning As Host". Deadline. Retrieved 2018-07-31. ^ Holloway, Daniel (2016-10-12). "Steve Harvey to Host 'Showtime at the Apollo' Revival on Fox". Variety. Retrieved 2017-11-24. ^ "Fox Swaps Pitbull for Steve Harvey on New Year's Eve". The Hollywood Reporter. Retrieved 2017-11-18. ^ Kiefer, Halle. "Maria Menounos Got Married on Live TV on NYE With Steve Harvey Officiating". Vulture. Retrieved 2018-01-02. ^ Ramos, Dino-Ray (2018-01-01). "ABC 'New Year's Rockin' Eve' Dominates Final Night Of 2017 Primetime, Ratings Jump For Fox's NYE With Steve Harvey". Deadline. Retrieved 2018-01-02. ^ Capehart, Jonathan (2011-08-16). "Smiley 'allergic' to my poverty tour reaction". The Washnington Post. Retrieved 2017-11-05. ^ "Where does Steve Harvey get off calling Travis Smiley and Cornel West "Uncle Toms"?". The Greanville Post. 2014-05-26. Retrieved 2017-11-05. ^ Davis, Rachaell (January 15, 2017). "Steve Harvey: 'I Won't Be At Anybody's Inauguration Because My Wife Said No'". Essence (online ed.). Time Inc. Retrieved May 21, 2017. ^ "Our biggest secrets are coming out! Dylan McDermott and Steve play 'Putt & Tell'". January 8, 2018 – via YouTube. ^ Behar, Joy (30 May 2009). "Steve Harvey on relationships". CNN. Retrieved 15 March 2011. ^ Chapman, Michael (2015-01-06). "Steve Harvey on Atheists: 'To Me, You're An Idiot'". CNS News. Retrieved 2017-11-05. ^ Rosenfeld, Ross (2017-04-27). "The attacks on atheists continue: Gov. John Kasich insults nonbelievers, and, par for the course, almost nobody notices". NY Daily News. Retrieved 2017-11-05. ^ "Steve Harvey under fire for making jokes about Asian men". NY Daily News. Retrieved 2017-01-16. ^ Schapiro, Rich (2017-01-14). "Steve Harvey in hot water with Asian-American New York lawmakers". NY Daily News. Retrieved 2017-11-05. ^ "Eddie Huang on Steve Harvey's 'Hypocritical' and 'Upsetting' Willingness to Emasculate Asian Men for Laughs". Vulture. 2017-01-15. Retrieved 2017-01-16. ^ Ungerman, Alex (2017-01-17). "Steve Harvey Apologizes for Racist Asian Jokes: 'Not Meant With Any Malice or Disrespect'". ET. Retrieved 2017-11-05. ^ Roskopp, Jack (June 14, 2017). "Did Steve Harvey really tell a Flint resident to 'enjoy your nice brown glass of water?'". Metro Times. Ferndale, Michigan. Retrieved June 17, 2017. ^ "'Little Miss Flint,' Mayor Karen Weaver blast Steve Harvey after water joke". WJBK. June 15, 2017. Retrieved August 2, 2017. ^ "Harvey in June 2008 Essence Mag Father's Day article". Archived from the original on October 14, 2013. ^ "STEVE". STEVE. Archived from the original on October 9, 2013. ^ a b Colacello, Bob. "Inside Paris's 25th Annual le Bal des Débutantes". Vanity Fair. ^ "Steve Harvey's ex slammed by judge for making false allegations". New York: Nydailynews.com. February 8, 2011. Retrieved June 10, 2015. ^ "Steve Harvey's Ex-Wife Blasts Him For Cheating". The Huffington Post. April 2011. Retrieved October 5, 2013. ^ Karu F. Daniels,His New Wife is the Woman Who Changed His Life Archived November 9, 2015, at the Wayback Machine, bvnewswire.com, November 6, 2009. ^ "Steve Harvey hitting town with new show". Articles.chicagotribune.com. March 12, 2012. Retrieved June 10, 2015. ^ Thomasos, Christine (August 6, 2012). "Steve Harvey Credits God for Career During Emotional Final Comedy Show". The Christian Post. Retrieved July 22, 2013. ^ Smith K. Steve Harvey is now vegan (and healthy_ becayse of Beyoncé. LiveKindly.com/Trends and Investing. March 11, 2019. Accessed March 18, 2019. ^ "Bet Awards '11 Exclusives: Humanitarian Award Winner Steve Harvey". Bet.com. Retrieved June 24, 2013. ^ "Steve Harvey accepts his People's Choice Award". YouTube. January 20, 2013. Retrieved June 24, 2013. ^ a b Huggins, Sarah (February 7, 2015). "2015 NAACP Image Awards full winners list – Zap2it | News & Features". Zap2it.com. Retrieved June 10, 2015. ^ a b "The National Academy Of Television Arts & Sciences Announces Winners For the 41st Annual Daytime Emmy® Awards | The Emmy Awards – The National Academy of Television Arts & Sciences" (PDF). Emmyonline.com. June 22, 2014. Archived from the original (PDF) on August 6, 2016. Retrieved June 10, 2015. ^ "The National Academy Of Television Arts & Sciences Announces Winners For the 42nd Annual Daytime Emmy® Awards" (PDF). Emmyonline.com. April 26, 2015. Retrieved April 26, 2015. ^ a b "The National Academy of Television Arts & Sciences Announces Winners For the 44th Annual Daytime Emmy® Awards" (PDF). Emmyonline.com. May 1, 2017. Retrieved May 1, 2017. ^ "The National Academy of Television Arts & Sciences Announces Winners For the 45th Annual Daytime Emmy® Awards" (PDF). Emmyonline.com. April 29, 2018. Retrieved April 29, 2018. Wikimedia Commons has media related to Steve Harvey.